...No, I didn't get it done at all! Sung off-key to "I Didn't Get to Sleep Last Night" by the 5th Dimension. I didn't meet the Historical Sew Fortnightly Embellish challenge and the little spencer sits just where I left it before the surgery, partly sewn. You see, I still can't see. Had to mend a pillowcase tonight -- little Christopher watched closely and walked me through where the thread was versus where the hole in the needle was, as I was attempting to thread it. The whipstitching I did by feel, not by sight. I know the stitches are even enough from touch. 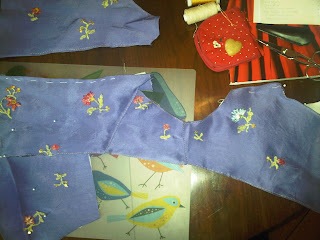 Should I trust my skill luck so far as to backstitch with yellow silk upon purple silk? No way. So we'll just have to wait until I get new glasses. ...What About the Rest of 2013? Once the new glasses arrive? Well, what with the surgery and its aftermath there was lots of time to think, and what I was thinking was this. Have to get healthy and stay that way so the rest of me has less chance to fall apart like the well-worn vehicle it's becoming. Used to be a cyclist, and a step class fiend (um, that's so ancient some of you probably haven't heard of it) at the gym. Loved weight-lifting. What happened? What about tennis? When was the last time my husband and I ran after stray tennis balls? That part was the real exercise for us, anyway, since it was what we mostly did when we played. What about the weekly long walks with friends, so full of chatter we forgot how many miles we'd gone? Blame the little boys. They took my time and my health and ran off with my heart into the bargain. They can keep the heart -- it will always be theirs -- but some time and most of my health? I wants them back! I'm attempting to sound light, but it's in all seriousness. No repeats of what I've been through these last 2-ish years, pretty please. Then there are the lack of curtains in windows, the walls that need painting -- or repainting, and so on. Home decorating again. Le sigh. It will be fun, once I get past the grim work part. Hate paintbrushes. Dumb, evil things. Something has to give, and you already know what the victim will be: the dear hobby. You Mean No Costuming At All, All Year? Deep breath. Exhale. You know that your heart slows down when you exhale and speeds up when you inhale? It's true, according to a recent study reported on NPR. So just exhale more than you inhale and you'll either calm down or faint. Don't quote me on that last bit: I was extrapolating from the report. I didn't say "no costuming"; just no new projects. We have projects to finish up. As in, truly be done with. The spencer, of course, and the lilac petticoat. Then the ensembles for each of these will need to be pulled together, and that means learning how to tie wrapped turbans, making earrings, arranging sashes and other accessories, and hair curling and styling and powdering. The 1790s were about the last gasp for that. Now you see wherefore all the Perruquier translating. I'll be working on papillote curls, lengthy chignons, and making powder, with the aim of achieving as accurate an effect as I can. The experiments should be lots of fun. Not time-consuming. Perhaps a hat to retrim, too. My best hat is looking tired and the ostrich feathers flop too much. Time to pull everything off and try, try again. So that's spring and summer. Then there's the fall. 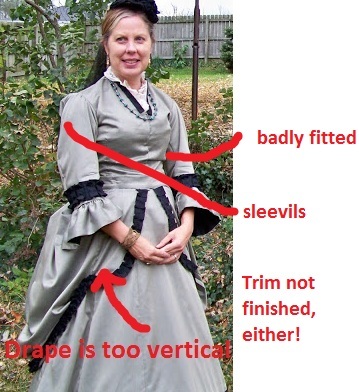 The 1870s dress needs work: side seams need taking in, the sleeves stink, the trim must be finished, and I have everything ready for one of those lacey removeable neck trims that were so popular, and the flat hat must be rethought. And oh, that hair. Must be fuller. Curlier. With side curls to create a cheekbone line but not look 1840s, and one or two dripping in the back. More hair styling and trying of hair products and switches. Wait just a minute. Begad. If I'd been 50 in 1870, I'd have been, let's see, 20 in 1840...so conceivably, I could really still slink in a side curl or two, the same way I might wear a day cap. You know, clinging to youth and all that. Oh, the horror. So think of this as a year of playtime. Nothing stressy, just playtime, while in the background I work on mending longterm health -- with exercise, not a needle -- play with the boys and husband and friends, and, oh, gargantuan sigh, wield a paint brush once more. Can't end with a paint-brush; what a downer. Think needles and thread and curtains, Natalie! Goodnight, dear readers! Next time, it's all about ways perruquiers help their clients "carry the hair". What's that? I don't know, either. Let's find out. Darling Natalie, you sound overwhelmed. I well know that feeling. The only cure I know for it is to write a darned list of everything there is to do, breaking down large tasks into steps, and start ticking them off. The sense of control and progress and satisfaction that comes from this is very freeing! You love painting? Oh, what a calm soul you must have. I'd love it if we could chatter and joke and paint. Just the thought alone is uplifting. Yes, a little overwhelmed, but you're right, lists make giant mountains into a series of manageable hillocks, if not molehills. The getting healthier will be fun, it's the house that's overwhelming. We're in year 10, my dear, that's why the dread. So today's a good list day, right? Thank you for the thumbs up!!!!! Ohhh, I want to send you hugs. I had major head surgery years ago, had a balance nerve cut, had to learn how to walk again, and I can no longer balance as many tasks as I used to. Hang in there, let God use you through this time to rest in Him and heal physically. I'm really lucky that my husband has banned me from most house upgrade projects, since I am busy homeschooling and I tend to get spots of paint on the ceiling. He can do a better job on his own. However there was a time when the kids were younger I did not sew at all but did lots of painting, landscaping, etc. The disorder is insane to live with I know. But I've seen pictures of your lovely home so do enjoy those spots when you can. Sometimes we just have to let go and do what we can do. Focus on one day at a time. Sounds like you have some fun little projects to fill in until you can return to your larger projects. Thank you so for your note: between you and Mrs. C., am feeling a bit less silly and a bit less "oooooooohhhhhhhhggggrrrrrr", as son Christopher is saying right now, being frustrated with a homemade invention that's not working. Having a nerve cut must have been just awful, and to be dealing with it now! Ugh. It's so fortunate you can focus on your family and schooling; your surroundings, as I can tell from your posts, feel vibrant but peaceful, if that makes any sense. Yes, I'm learning to let go. It's kind of hard for a Type A neatnik :} Yet family joys trump stylishness any day, and the more I realize that, the more relaxed I can be. Oh nuts, break time's up. Now for the bedtime/readtime routine! There never can be too many pictures about your spencer-in-progress...nowadays we tend to have lost the ability to look forward to something and wait, we want everything asap...slowing down is the best answer and learn to enjoy the process itself. Whatever you choose as projects for this year (may it be sewing, sports or researching) it is not the number of results that counts, but the happiness it brings. Huge hugs. You are right: living in the moment, every day. I think the Dalai Lama as well as, was it the Desert Fathers whose mantra was "today", "today", when they became despondent? I have enjoyed reading your blog, and I must say, I agree with your resolution! I have spent the past year dipping my fingers into every little pie that I could find, and sometimes I neglect other things (my health, putting buttons on my coat, etc.) Sometimes it is great just to slow down focus on finishing up old projects. I understand; I have the fabric for 3 dresses packed in my little sewing room, with a fourth on my dress form! Remember to take care of yourself! Healthy exercise waved off, buttons and rips neglected? Yup...I understand :} Yes, slowing down is delightfull. Am getting healthier and less stressed, and it's nice.